Flight. 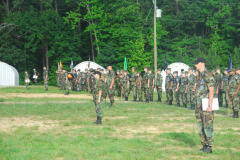 Make sure you like the Facebook page for updates and pictures from Encampment. The advanced ground team flight learned about Search and Rescue techniques,survival, a map course, and completed several tasks for their ground team qualifications. The basic ground team flights completed many tasks and have also completed first aid and are on their to getting all basic ground team certifications. Aerospace flights completed their induction to Aerospace and have passed many aerospace tests, as well as, building rockets. Leadership flight have done their first inspection, have been taught classes on professionalism, wingman and warrior spirit discipline, as well as a prompt to speaking. They are being taught the importance of teamwork and discipline. Flight Line marshalling flight has completed first aid,ground handling, and baton building and has successfully marshaled aircraft at the airport. MRO flight has done, ICUT, teambuilding, radio operating,message handling, and professionalism. They have also completed chain of command, core values, radio presectures, choosing a good communication sight, and taking steps to regain communication. Staff Training Flight has completed professionalism, leader and follower relationships, staff positions, FLM course, AE rocketry course, ground team course. the rest of their life. Whether it’s a compass course or learning about the aerodynamics of a rocket, the cadets that attended this years encampment will walk away with a valuable life skill and the sense of leadership and teamwork. Thank you to all who made this possible!